Actual current photo. I am reading to my favorite 8-year-old as part of a mentor/mentee program at the local school. Vermont College of Fine Arts. I was core faculty, MFA in Writing for Children and Young Adults Program. Best in the country, the world, the universe, if I do say so myself. There, I did. The anti-author photo: Mary Azarian, illustrator of HERE COMES DARRELL, and I pose with excavator. Try using a magnifying glass. Late 2018 news: I have THREE more picture books coming out in the next few years. I am surprised and delighted, because who knew this would happen? Details to come. 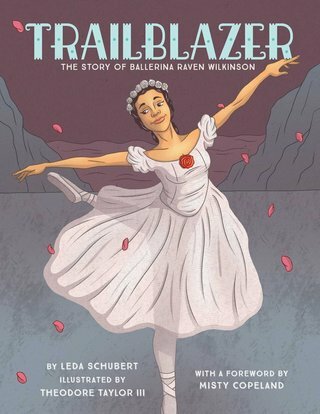 My new picture book biography, TRAILBLAZER, was published in January, 2018. Don't you want a copy? You know you do. Click on the title on the right column for more info. And why can't I move that to the top of the list? Nobody knows. Here is a link to an article in HuffPost about TRAILBLAZER. Way cool. 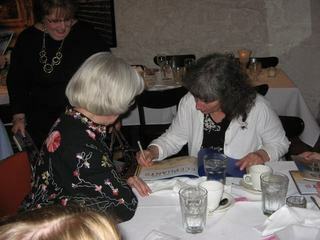 And here is a link to an article in TIME about TRAILBLAZER. Also way cool. I am so happy that Raven is getting the attention she so deserves. Another article about the book is here. 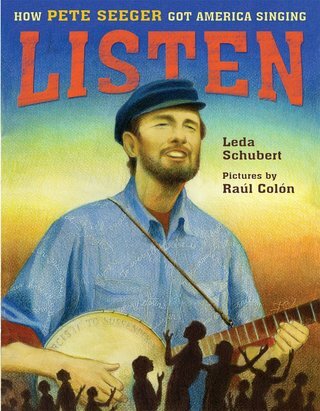 ALSO: 2017 picture book biography of Pete Seeger. From Neal Porter/Roaring Brook Press, illustrated by Raúl Colón. VERY EXCITED!!!! Click on the book's title on the right for info and links for Pete's music, etc. 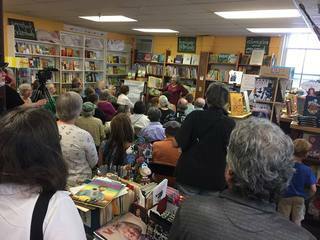 Photo from book launch for LISTEN: HOW PETE SEEGER GOT AMERICA SINGING! I am there, hiding. My favorite kind of picture of me. Champagne-worthy STARRED Kirkus review (thank you, Kirkus!) is going right here on my home page. "Pete Seeger’s lifelong commitment to songwriting, singing, and activism made him a beloved figure in American music. “Pete sang old songs, new songs, old songs with new words, and songs he made up.” Schubert intersperses her simple, graceful text with the titles of three dozen familiar songs written or made famous by Pete Seeger, demonstrating how thoroughly Seeger’s music permeates the American folk-singing tradition. Colón’s richly colored and textured full-color illustrations convey the warmth and joy Seeger demonstrated in making and sharing music. Seeger is shown singing with the Weavers and with his friend Woody Guthrie as well as with crowds large and small. The faces of his audiences and singing companions across all the years are diverse. One striking double-page spread following the account of Seeger’s 1957 citation for contempt by the House Un-American Activities Committee subtly conveys the changing landscape and struggles of the laborers Seeger championed. A highway crosses hills where people are working the fields; a large billboard in the foreground advertises a 360-acre golf course down the road. Schubert and Colón capture with affection and respect Seeger’s remarkable lifetime of speaking truth to power through music and engaging the hearts of his audiences. A biographical timeline includes a charming selection from a boyhood letter, contemplating a banjo purchase; the generous resource list includes source notes and recommended recordings. 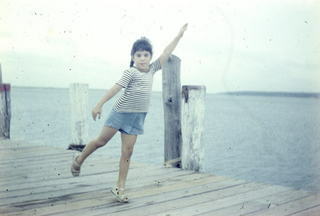 Here I am practicing arabesques at about age four or five. I always wanted to be a ballet dancer. I am not. But I still love striped t-shirts. All website material copyright Leda Schubert, the publishers, or the artists.